The internet revolution has produced a golden age for punters, with a large number of bookmakers competing for the betting pound/euro/dollar/naira. This has produced fantastic opportunites for those disciplined enough to exploit it, with margins virtually non existent if you shop around to get the best prices. Essentially if your opinion is any good you really ought to be winning and winning regularly. 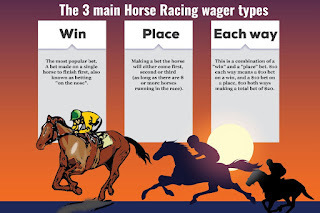 Based on experience on both sides of the fence, I have come up with some golden rules for successful wagering on the horses. There is so much racing, especially in the Summer, that it's virtually impossible to be on top of all of it, and attempting to do so is liable to dilute ones views and lead to errors in judgement. Try and find an area that you can get to grips with the form in. For example, novice hurdles or 2Y0'S on the flat. Bet only in these races and watch every one of these races. Specialising in one area means you can easily use a database to log all your views and notes on every race. Several companies offer ready made versions, which allow you to insert your own views alongside their own expert analysis. This is essential to anyone who wishes to try and profit from betting on the horses. There have been thousands of excellent judges of form who fail at gambling simply because they "bet what they fancy and a winner is a winner". The only way to form an accurate view of when it is time to bet is to price up the races to 100 per cent. If for instance you price up a three horse race at Evens, 3-1 and 3-1, but the actual prices available are 6-4 2-1 5-2, then the "value" lies in betting the 6-4 chance. Clearly this is a simplistic example and racing is not black and white but it is still an excellent habit to get into and stops ill discipline and having too many bets. The Summer months of racing are traditionally the hardest for layers. Put simply, the weather is usually dry and the ground stays the same, on the fast side of good. However when the weather changes so do the results. Be careful analysing form on fast ground when the actual race may be on soft. This is why there are bookmakers! This is the least considered but arguably the most important factor in analysing a race you intend to price up and wager in.Try to understand the run styles of the protaganists and what suits them best. For example if there are two headstrong frontrunners in the race, both are liable to ruin each other up front and tee the race up for a hold up horse. Similarly if something is sure to get a soft unpressed lead it is much more probable it will give its best running.A lot of this is a "feel" thing that will come from experience of watching thousands of races and keeping accurate notes. Generally the horses from the bigger, well established yards tend to be overbet in relation to the form they have actually achieved. Try and steer clear of hype and "info" and focus on what you have seen with your own eyes. Younger trainers just starting out tend to be more up for the game than those that have already enjoyed success in the past. 0ver the jumps for instance "new" trainers such as Neil Mulholland and Charlie Longsden have made excellent starts which the betting market has yet to reflect. Discipline is paramount and essential for weeding out bad value bets. As a punter for around 20 years now I personally try and avoid betting odds-on and focus mainly on each-way opportunites. The hit rate needed when betting odds-on regularly is very high and with Betfair dictating prices these days, it is very hard to find any price advantage at this end of the market. Much better to play in 8, 9 or 10 runner races each-way where the terms are very much in the punters favour. This is no better illustrated in the Betfair place-only prices which are often significantly less than what is avaliable using a traditional bookmaker. This is becoming more and more relevant to finding winners and is a constant source of frustration to punters on the flat. More and more, for whatever reason, certain parts of racecourses have faster strips of turf that see those horses drawn high or low enjoy a huge advantage. It is important to record this bias and remember it for future betting. At Folkestone for example this season, of ten sprints on the straight course, nine have been won by those drawn in the two stalls nearest the stands rail. So often horses ridden by star "name" pilots are underpriced simply because punters believe they have been booked because connections expect them to win. Also they have a huge betting shop following who simply bet anything that L Dettori or A P McCoy rides. As is so often the case with successful betting, staying away from the mainstream view is often the best option. Try and spot young riders who are strong and decent judges of pace. With their claim (a reduction in weight the horse has to carry because they have yet to ride a certain number of winners), they can represent more value if you notice them before everyone else. Hopefully these "rules" will be of help to younger players interested on betting on horse racing. As with most things, the more hard graft you put in, the more you get out.